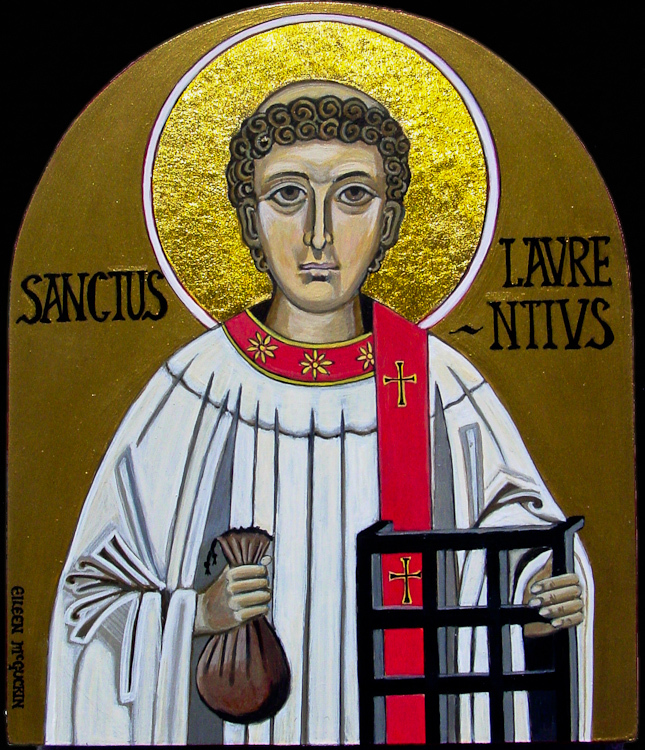 The accounts recorded about a century later by Ambrose and the poet Prudentius report that the Roman prefect, knowing that Laurence was the principal financial officer, promised to set him free if he would surrender the wealth of the Church. Laurence agreed, but said that it would take him three days to gather it. During those three days, he placed all the money at his disposal in the hands of trustworthy stewards, and then assembled the sick, the aged, and the poor, the widows and orphans of the congregation, presented them to the prefect, and said, “These are the treasures of the Church.” The enraged prefect ordered him to be roasted alive on a gridiron. Laurence bore the torture with great calmness, saying to his executioners at one time, “You may turn me over; I am done on this side.” The spectacle of his courage made a great impression on the people of Rome, and made many converts, while greatly reducing among pagans the belief that Christianity was a socially undesirable movement that should be stamped out. Commemoration Ss. Tiburtius Agrestius Chromatus was vicar to the prefect of Rome, and had condemned several martyrs in the reign of Carinus; and in the first years of Diocletian, St. Tranquillinus, being brought before him, assured him that, having been afflicted with the gout, he had recovered a perfect state of health by being baptized. Chromatius was troubled with the same distemper, and being convinced by this miracle of the truth of the Gospel, sent for a priest, and, receiving the Sacrament of Baptism, was freed from that corporal infirmity. Chromatius’s son, Tiburtius, was ordained subdeacon, but accused by a traitor, he was brought before the prefect Fabianus and tried. He confessed his faith, which he confirmed by a miracle, for, protecting himself only by the sign of the cross, he walked barefoot over red-hot coals without suffering any injury. But the miracle was ascribed to magic and Tiburtius was beheaded at the third milestone of the Via Labicana in the year 286. The spot of execution was called “at the two laurel trees” (ad duas lauros). His father, Chromatius, retiring into the country, lived there concealed, in the fervent practice of all Christian virtues. St. Susanna (icon) The beautiful daughter of Gabinius, a priest, and niece of Pope Caius, Susanna refused Emperor’s Diocletian request that she marry his son-in-law, Maximian and converted two of her uncles, Claudius and Maximus who were court officers sent by Diocletian to persuade her to marry, to Christianity. Diocletian was so enraged by what she had done that he sent one of his favorites, Julian, to deal with the matter. Julian had Maximus, Claudius and his wife, Praepedigna, and their two sons, burned to death at Cumae, and then had Susanna and her father beheaded. May the constant protection of Your holy Martyrs, Tiburtius and Susanna, support us, O Lord, for You never fail to look mercifully upon those whom You have given the help of such intercession. Through Jesus Christ, thy Son our Lord, Who liveth and reigneth with thee, in the unity of the Holy Ghost, ever one God, world without end. Heed the prayers of Your people, O Lord; look with favor on their offerings, so that what is offered in this sacred rite may please You by the intercession of Your Saints. Through Jesus Christ, thy Son our Lord, Who liveth and reigneth with thee, in the unity of the Holy Ghost, ever one God, world without end. We have received, O Lord, the pledge of everlasting redemption; may it, by the intercession of Your holy Martyrs, be our help both now and in the life to come. Through Jesus Christ, thy Son our Lord, Who liveth and reigneth with thee, in the unity of the Holy Ghost, ever one God, world without end.